If you look at Oriental art as a whole, you would think that Chinese, Japanese and Korean art forms seem somewhat the same. But on closer inspection, while there were elements that might be related, each one has developed a style that’s all their own, after borrowing aesthetics from Chinese art, which is the oldest culture among the three. Korean art, like Japanese art, heavily borrowed concepts, forms, techniques and motifs from its nearest neighbor, China, which had a very strong influence in the Korean peninsula for thousands of years. Yet Korea’s art forms became distinguished for its spontaneity and simplicity. It was closely related to natural things, a concept that had been established since the Silla Period, around 668 to 935 AD. You can see it in their wood carvings, which focused more on the wood grain. It is eminent in their ceramic art as well, which did not dwell on technical perfection but in showing the natural characteristics of the medium and the materials the potter used. In short, Korean artists limit human intervention in their art pieces as much as possible. Colors are kept simple and artists favored mellow, gentle and fluid lines rather that extreme curves and straight lines. 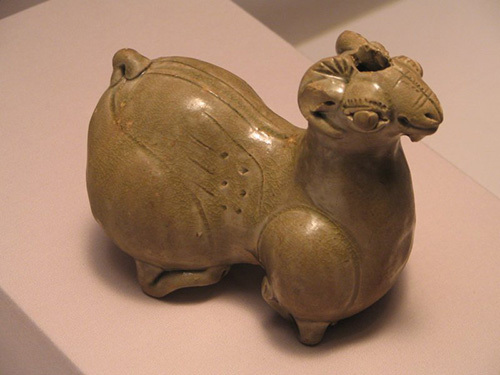 Although Korean art was influenced by China, there were still plenty of evidence that the peninsula, which was inhabited by people from Siberia by way of Manchuria, also has prehistoric art such as rock art and primitive clay utensils and pots. Chinese influence became evident during the Neolithic Period, where Korean pottery showed improvements in their flat-bottomed pots decorated initially with zigzag designs before being replaced with comb-pattern designs. During the Bronze Age, Chinese influence on Korean ancient art became greater, with the creation of painted wares similar to the Xia culture and art forms during the Shang and Zhou dynasties. It showed in their mirrors, bronze daggers, and their jade carvings. Nangnang, which is the close to the location of present-day Pyongyang became the center for metalwork, bronze sculpture and pottery. The recorded history of Korean art started in 57 BCE during the emergence of the Three Kingdoms: Goguryeo, which was linked to northern China and now the site of Pyongyang; Baekje, which was established in southwestern Korea and closer to the southern part of China and Silla, the remotest kingdom that was located in the southeastern part of Korea. The kingdoms of Silla and Baekje had stronger ties with Japan. Chinese writing was first introduced to Japan by rulers of Baekje, while gray stoneware was introduced to Japan by Silla artisans, which were later replicated by Japanese potters as Sue pottery during the Kofun (Tumulus) period. When Buddhism was introduced by China into Goguryeo, religious art became in fashion, from architecture to ivory and jade carvings. The main difference is that Buddha’s face in Korean art was more expressive and rounder and had that enigmatic “Baekje smile.” Chinese calligraphy was also introduced during the introduction of Buddhism, and Kim Saeng from the Silla period became the first calligraphic master in Korea. In tomb art, the most beautiful examples excavated were from the tomb of 6th century king – King Munyeong – which showed some exquisite goldsmithing samples and other art forms, such as lacquerware, paintings and murals. The Three Kingdoms had several exemplary art forms, such as stone sculpture and decorative arts including jewelry in glass, jade, silver, gilt-bronze and gold. Representative pottery included the gray, unglazed and hard stoneware typically made with animal and human figures on the jars’ shoulders. 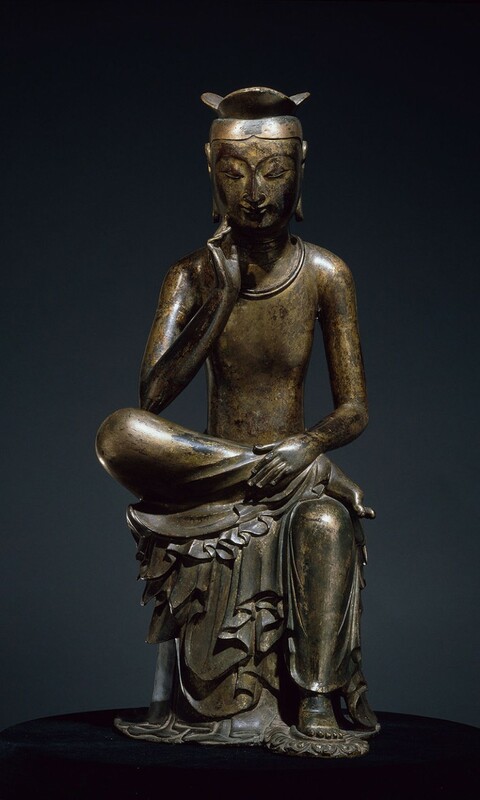 One fine example of Korean artistry is the Tripitaka Koreana, a Korean national treasure from the 13th century. Created during the Goryeo period, this treasure is composed of over 80,000 error-free, human-carved woodblocks, showing the Buddhist code in its entirety. The volumes are housed at the Temple of Haeinsa on Mount Gaya. During the Joseon period, which started late in the 14th century, Korean religion turned to Neo-Confucianism, with anti-Buddhist measures imposed by the dynasty’s founder, King Yi Seonggye, which led to the creation of a new elite class that ruled the bureaucracy. It supported the Ming Dynasty and showed the revitalization of the native cultural traditions of Korea, with landscape painting as the foremost genre. Prominent during the initial period was An Gyeon, an official Joseon court painter, whose paintings showed strong contrasts of light and dark and forceful brushwork. Still, Buddhism was not completely erased and ordinary citizens started to create folk art or minhwa, which showed paintings of people going about their daily lives. It was also during the Joseon period that white porcelain became the high valued artistic style, much like Chinese porcelain, and replaced the traditional gray-green ceramics of old. Yet, Korean ceramics opted for simplicity, embodying the Neo-Confucian ideals of frugality and purity. By the 17th century, Korean independent identity had emerged, which also showed in its art forms. From idealized landscapes, artists painted landscapes based on true Korean scenery. It was also during this period that genre paintings flourished, where artists concentrated on depicting the expressions of individual figures against stark backgrounds. Japan tried to suppress Korean art by destroying them when they occupied Korea in the 19th century, which reverted to traditional expressions with a touch of modernism after World War II.